Wow! Rare find in hard-to-acquire Stonegate - a Parker premier neighborhood! Awesome home with lots of bells & whistles - 50yr tile roof, hardwood floors; main floor study; open kitchen/family room concept; amazing master with awesome view, remodeled master bath, space saver walk-in closet; kids bath w/ laundry chute; feature-rich walkout basement w/ private guest retreat & bath, secondary family/media room incl gas fireplace, game room. Home faces large trail system to park and private walking pond. Chaparral High's Homecoming Parade comes within a block of the house every Fall. Walk to one of the pools, elementary, high school, or tennis courts. Larger Stonegate pool w/ water slide short drive away. Downtown Parker small-town bliss - Xmas parades, ice sculpting, Santa, quaint restaurants, music, wine, tapas. Parker Days every summer – carnival-type event. 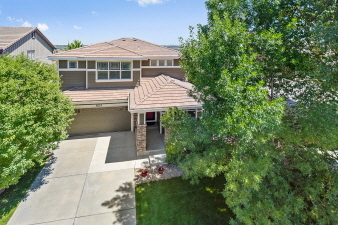 Super-easy access to I-25, C-470, Tech Center, airport, shopping, & restaurants. Hurry on this one! Buyer to verify all.